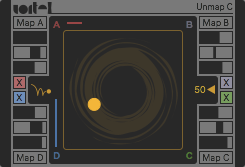 Vortex is a 2 dimensional touch controller, where you can assign all 4 corners of the "Vortex" to any mappable parameter in Live. You can set the depth, the offset and the smoothing for each corner. Also, the movement could be recorded as automation. As a bonus, there is an automatic, bouncing ball option, where the ball bounces inside the "vortex" and you can control the velocity of it. PMM stands for Precision Master Meter. The device gets the dB values from Live through the Live API. The meter shows the values with 3 digit precision the max. peak amounts are in red (above 0dB) until reset. With Ninja, you can randomise the playback position of an audio clip in your Live set. As an addition, you can randomise (or automate) the coarse and fine pitch settings of the clip. Attention ! Using the pitch randomisation function could fill your undo history! KR stands for "Keyboard Random" and it generates a random API control signal in case of a specific incoming MIDI note. You can filter the MIDI note and then map the random output to any parameter in Live.